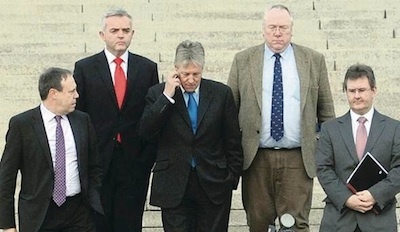 The failure to honour the agreement to elect a Sinn Fein Speaker, an agreement set out publically by Peter Robinson on the floor of the Assembly, calls into serious question the DUP sincerity on facing into renewed negotiations. When I nominated DUP MLA Willie Hay as speaker in the Assembly, I did so in good faith and without the slightest hint of reluctance or negativity. I personally honoured the agreement made. The DUP’s bad faith in the Assembly on Monday is in stark contrast and illustrates and underlying resistance to equality and power-sharing. This bad faith and reneging on agreements is no way to do business and is contributing to a growing crisis in the North. The DUP has failed to honour commitments made in the agreed Programme for Government on the Education and Skills Authority and on the development of the Maze/Long Kesh. The DUP refused to sign up to the compromise Haass/O’Sullivan proposals on the issues of flags, parading and the legacy of the past. They walked away from the all-party leaders talks over a demand for an Orange march through an nationalist area of north Belfast, then demanded new talks and now their party leader says he will not attend the opening plenary of these talks. No wonder people are confused and deeply sceptical of DUP intentions. Clearly the divisions in the DUP and the pandering to anti-agreement elements is contributing to the growing crisis in the political process. For our part, Sinn Fein believes that the institutions and the agreements endorsed by the people are the best and only way forward. We are entering talks with the objectives of resolving issues and securing the implementation of existing agreements. These talks must be free from preconditions and threats. Unionists cannot exclude the Irish government, a joint guarantor of the process and agreements, or link progress to a single Orange parade in north Belfast. Similarly, the British government should lift their threats of welfare penalties. Both the Irish and British governments must live up to their responsibilities as co-equal guarantors of the agreements. They need to make it clear that those agreements are the only way forward and must be implemented fully. We in Sinn Fein have honoured our agreements. It is now time for the DUP and the British government to do the same.